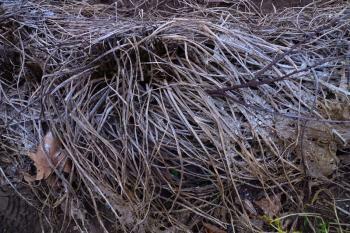 A thicket of rocket growing in the irrigation canals and dried mulch rotting on the beds. Relaxed permaculture is what I’ve decided to call this gardening technique, tailor-tuned to my garden and me. One of the principles of permaculture is to keep the ground covered at all times with either plant matter or a thick layer of mulch. 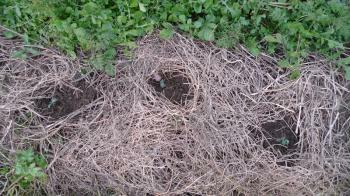 This technique simultaneously keeps out the ‘bad weeds’ while nourishing the soil with plant combinations and/or green manures. I hope the images that I’ve just taken of my kitchen garden at midwinter offer a clear illustration of some of the techniques that have been successful for me this year. 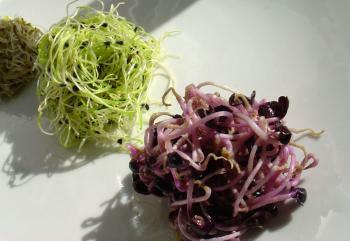 Brussels sprouts and broccoli in a sea of rocket. My garden is left to its own devices for weeks, sometimes months on end each time I return to the far-away Polder Circle. I’ve developed a permaculture technique for growing green manure ground covers in situ, using them alive or folding them over (felting) into mats and letting them dry sur place. 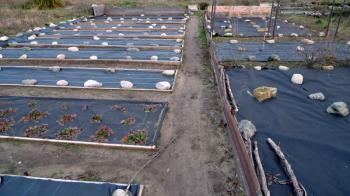 I place these mats on the beds, and plant my crop seedlings in between. The thick mat prevents weed growth, and within two seasons it rots in place, so that I’m always planting the vegetable seedlings in the ground that is most nourished with organic material. 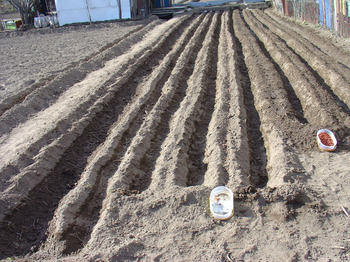 I don’t turn the soil, just aerate and loosen it up a bit with a pitchfork when I plant the new seedlings. This keeps the carbon underground and prevents the oxidation of soil nutrients. Here’s how nature does it: a heap of horseradish rotting away, new shoots poking through the old leaves. Plants left to their own devices do this naturally. See above how the horseradish holds its ground against plant competitors, covering the soil so that the new growth peeking through can monopolize the full plant foodtprint of sunlight and soil nutrients. I’ve sprinkled some wood ash to aid in the rottage. Leggy bergamot being harvested for felted mulch in the upper garden, rocket on the right. The above image shows the harvest process of my overgrown bergamot mint, (end of November) which I grow in the irrigation canals. At seaon’s end, I lay down the bergamot in swathes and chop it off at the base with my sharp and trusty Opinel. 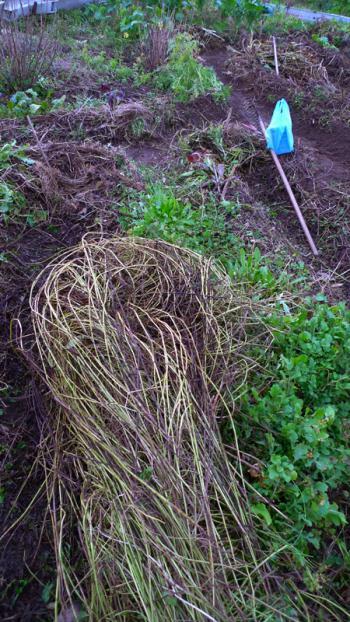 With a sweep of an overly muscular left arm, I roll the stalks into mats which I place on the paths or on the beds. 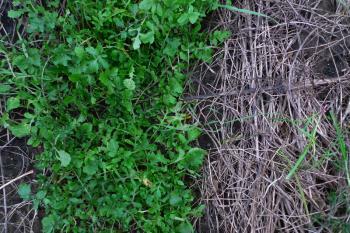 The finished mat looks like lace, especially when you cut back long-stemmed plants like mints or alfalfa. And the chopped-off bergamot grows back instantaneously if not even more vigorously. The entire process smells like brewing a garden-sized pot of Earl Grey. 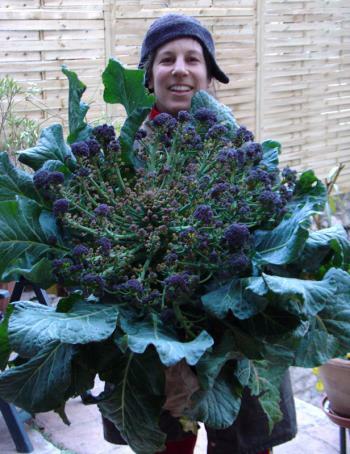 Lower garden broccoli babies growing in the summer’s phacelie hay, rocket in the canals. When I want to plant a new crop, I just pull a hole in the mulch matting and plant the seedling. Outside the summer months, I’ve visited the garden every 6-8 weeks this year, and this technique has served me well. My garden is constantly producing edibles, shocking considering the months of neglect. In fact, it’s probably because I’m not around that I can grow even more green manures on my paths and canals, because I’m not treading on them all the time. In light of the hours spent in the garden, the difference in productivity between my gardens and those of my neighbours is extreme. 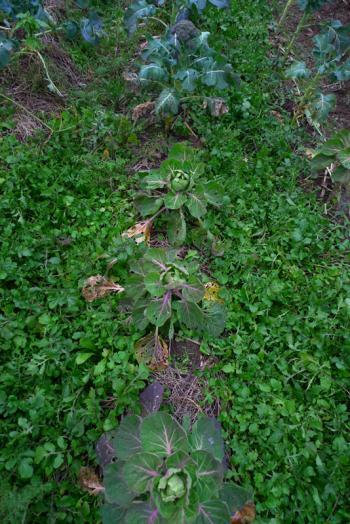 This year the tall-growing mustard and phacelie also provided frost cover for the lower-lying brassicas and rocket. It’s January and my garden is full of leafy green produce. By comparison, garden neighbour Monsieur C. wages his war on weeds by sealing off the soil from the great outdoors with large swathes of plastic. 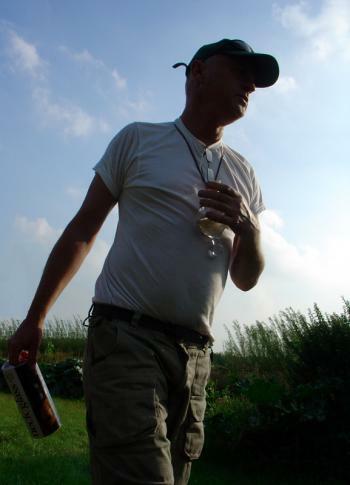 To compare my relaxed permaculture with another technique, check out my petro-fertilising garden neighbour Monsieur C. Formally speaking, his technique is similar to mine except that he hermetically closes off the entire surface of his garden, denying access to light and rain (and weed seeds blowing in). Like me, C. also plants his crop in little holes cut out of the mat. His technique would be exquisite as an art installation but it also successfully wards off the potential for any scrap of organic matter from entering his pristine soil. (And you don’t call it soil for nuthin’.) Essentially he’s growing hydroponically with nutrients sourced from chemical fertilizers. When C. returns to his garden in April he will spend no time weeding. Instead he will spend time removing the stones, laying out and rolling up the large black plastic mats, and driving his car to and from the garden centre for a steady fix of petro-chemicals. 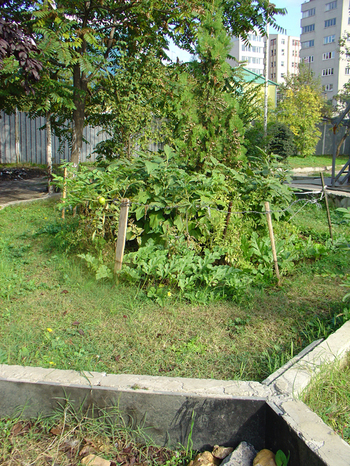 His garden is highly productive and brings him and his family lots of joy. Because my gardens are upstream and more often than not upwind, in his case I can be generous (and by generous I mean self-righteous and cranky) and declare, ‘to each his own’. *Permaculture Activist is the name of an informative quarterly about permaculture in the broadest sense of the word. Don’t mind the bears. And the beards.